1. Make sure your concrete (whether it is a driveway, parking lot, drive lane, sidewalk, steps, etc.) is properly treated and ready for winter. 2. Make sure to do your research on what product to use on it with the ice and snow! In our last blog we mentioned the importance of sealing your concrete project. We listed a sealer we use. We highly recommend getting this done, EVEN IF your concrete is not new, to prevent cracking and spalling. Sealers can deteriorate over time, therefore you want to re-seal your concrete every four to five years. When our professionals seal concrete they use a “penetrating sealer” at least 30 days after the concrete was poured. This is something you can do yourself but you want to make sure you follow the directions on the container. Things to pay attention to are: concrete is dry, the temperature, how do apply the product and etc. Otherwise, let our professionals get this done for you – that way you can cross one more thing off your list! 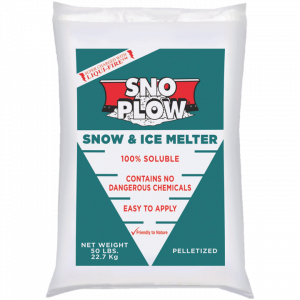 One of the items that we recommend and use ourselves is Sno Plow Snow and Ice Melter. This blend contains no dangerous chemicals – it is 100% non-toxic to children and pets and can be handled with bare hands. This is a magnesium coated product that includes an anti-corrosive chemical to help fight corrosion. It is also green in color making it more visible, this makes it easier to make sure you don’t overcoat! ALWAYS use ice melt as sparingly as possible! If you have a brand new concrete project (less than a year old), you want to stay away from ice melt as much as possible. It is recommended to not use ice melt at all and use sand and a shovel. The above recommended ice melt even states not to use on concrete less than a year old. Obviously with driveways and sidewalks this gets tricky. Sand does not melt ice but gives you traction on the ice. If you do use on new concrete use even more sparingly than usual and shovel off as soon as possible. Keep in mind, not everyone uses a non-corrosive ice melt! Your vehicle may pick up corrosive materials from streets and parking lots and bring them to your property. Having your concrete sealed is a great way to prevent the damage that these corrosives cause. Good luck with conquering your list!!!! « Why do I need that? The products we use and why we use them.